From 1982 through 1986 Helquist reported extensively on medical research, behavior change, and social policy for several national and local publications, including The Advocate – The National Gay News Magazine, Ms. Magazine, American Medical News, the San Francisco Bay Guardian, and the Oakland Tribune. His biweekly column “The Helquist Report” in The Advocate and his monthly column in San Francisco’s Coming Up! were considered essential reading for the early HIV prevention pioneers and public health officials. As a freelance journalist and columnist, Helquist also published reports in community newspapers across the country about the medicine and politics of HIV/AIDS. In San Francisco his work appeared in the LGBT newspaper Coming Up! (known today as the San Francisco Bay Times); in Portland, he published in Just Out. 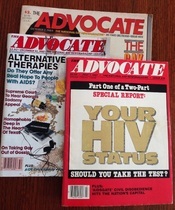 During this period Helquist also collaborated with health care specialists to write and edit first-of-their-kind volumes, such as WORKING WITH AIDS, A Resource Guide for Mental Health Professionals and Face to Face: A Guide to AIDS Counseling – both published by the AIDS Health Project, University of California San Francisco; and AIDS: A Self-Care Manual published by AIDS Project Los Angeles. Helquist edited the first national monthly newsletter FOCUS: A Guide to AIDS Research and Counseling. Helquist served as an independent contractor to the Centers for Disease Control and Prevention, the U.S. Agency for International Development, and the United Nation’s Global Programme on AIDS. From 1987 to 1993 he worked as a Program Officer and later Director for the U.S. State Department’s AIDS Communication Program, AIDSCOM, providing assistance to counterparts in 42 developing countries worldwide. He helped Caribbean nations establish their first HIV/AIDS social marketing programs, including hotlines, PSAs, and counseling and training guides. For the Sixth International Conference on AIDS held in San Francisco in 1990, Helquist was invited to be the Chief Rapporteur on Public Policy Issues. He emphasized in his session how lack of political will and homophobia ensured unequal access to medical care and prevention strategies. In November 1993 he co-edited “A World Against AIDS, Communication for Behavior Change,” a summary of the communication and behavioral interventions of AIDSCOM.